One of the incongruities of our legal system is that television is allowed in our trial courts (at least at the state level) but not at the appellate level. While some appellate arguments can be mundane and boring, others, especially at the U.S. Supreme Court level, present the legal system at its best: A high level discussion of how the law affects society and should be used to improve the world we live in. For many years, it has been strange that Justice Clarence Thomas has remained silent during oral arguments. Now, according an an article in the Wisconsin Law Journal, he spoke up for the first time in seven years. 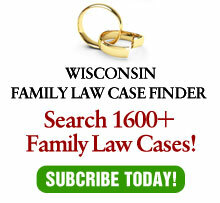 I’ve been fortunate to have argued two cases before the Wisconsin Supreme Court (I’ve also presented two rule petitions regarding Guardians ad Litem practice). Both experiences were among the most exciting moments in my 35 years as a lawyer. Oral argument presents the opportunity to answer questions (sometimes sounding like an argument!) from seven of the best legal minds in the state. It is a monumental challenge and greatly exciting. I can only imagine how much more thrilling it must be to argue before the U.S. Supreme Court. Let’s hope Justice Thomas keeps talking. And that, if we want to improve the public opinion of our legal system, instead of just showing snippets of a sentencing hearing with the emotional pleas, the public would have the opportunity to understand the issues involved in shaping our society through law. It won’t win any ratings war – but it would be entertaining and educational.